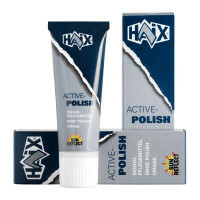 Product information "HAIX Special Fighter Pro"
Moisture wicking comfort insert with cushioning effect and antibacterial properties. 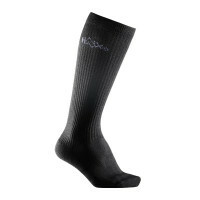 Separate heel cup ensures optimized cushioning and foot guidance. „AIRFLOW“ channels. „Perfect-Fit“ marking for optimized boot size choice. Flexible, lightweight metal sole insert preventing punctures (patent pending). 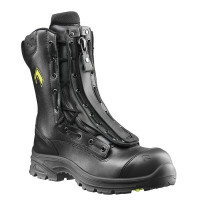 Lightweight rubber/PU sole in a sports style with sturdy road/rough terrain profile and enhanced toe-to-heel support; wear-resistant with excellent anti-slip properties - even in cold weather. The lightweight PU shock absorption wedge provides extra walking comfort and excellent thermal insulation. The flame-resistant outer sole is non-marking according to EN 15090:2012 and offers excellent resistance against heat, oil and fuels. Its bright yellow signal marks are visible even through thick smoke. Anatomically shaped, ultra-light toe capmade from fibre-reinforced synthetic, conforming to the highest safety standards. Optimal ankle support and shock absorption in the arch provided by an anatomically formed last; good foot guidance and proper hold thanks to narrow heel and ankle shaft combined with added comfort through broad front foot area. Reduces heating effect on the upper leather. Sunlight is reflected, keeping leather and feet cooler. Für 1 Paar Schuhe werden 2 Laschen benötigt.